A typical keyphone system/PBX consists of a PABX server/ key phone server, multiple phones or extensions in side the company and phone lines directly from providers. Typically these telephone line comes from Telekom Malaysia (or any telecommunication service provider in any country). The use of keyphone system/PBX system is to enable intercomm within company, share out going phone lines, thus save a lot of telecommunication cost. 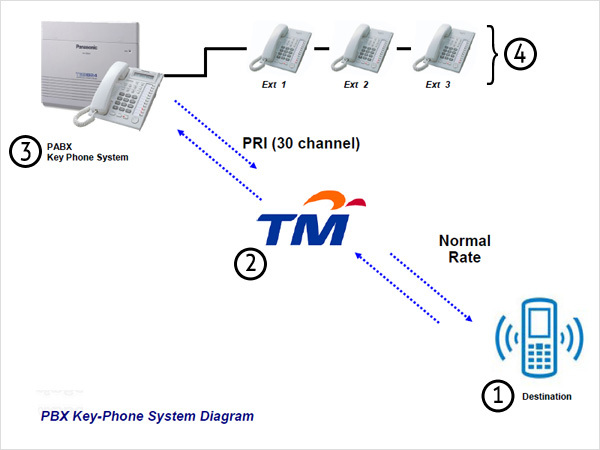 When anyone calls, it send voice from phone (1) to TM (2), the TM (2) determine that this is your call and route to your number. Your PBX/ keyphone system (3) will pickup the ring. The PBX/keyphone system will then answer the call via IVR (interactive voice response) asking the destination extension or pass the calls to the direct extensions (4). If the extension1 (5) found that the calls are not looking for him/her, he may pass the line to extension2 (6) and this goes on daily.